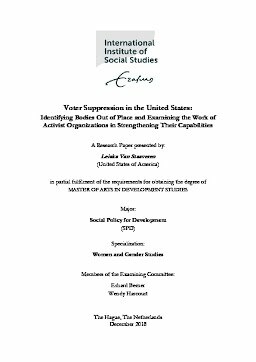 This research paper analyzes the impact of voter suppression tactics on specific populations in the United States, including people of color, the youth, the elderly, the poor, rural voters, women, and members of the LGBTQ+ community. While voter suppression has been an issue in the United States since the Jim Crow Era, the 2013 Supreme Court Case Shelby County v. Holder and the subsequent election of Donald Trump have unveiled a resurgence of tactics, legally permitted to be implemented at will. The paper presents the history of voting rights and voter suppression in the United States as well as findings from interviews conducted with individuals from five activist organizations working to combat voter suppression, basing the analysis of the data in Barbara Harris Combs’ Bodies Out of Place theory. The analysis is performed according to the different places from which particular bodies are out of, as revealed to the researcher through the interviewing process, including states with restrictive registration and voting laws and policies (using the example of Georgia), university campuses, and prisons. It is hoped that the findings can encourage an intersectional approach to voting rights lawmaking and inform voting rights expansive social policy.